"The Tornado II and F5 paint shakers are very similar in construction but differ in only one area. Before we get into to the details of these paint shakers, I'd like to go over why these units are useful to both the commercial user and the DIY user. These paint shakers allow you to mix up your paint in a very efficient manner and allow for a through mix of your paint. These paint shakers will completely mix up any amount of dye that is in your paint and remove any sedimentary deposits at the bottom of the can. These shakers use an orbital shaking method to mix up your paint. The Tornado II and F5 simultaneously shake the paint can up and down, left to right, and front to back. This motion creates a orbital motion that mixes up the paint. These paint shakers are easily portable which makes them ideal for commercial painters as well as DIY users. They will plug into any 110 volt outlet and can be special ordered in a 240 volt configuration. Both of these paint shakers come with the necessary hardware to attach a variety of paint cans to the base plate of the shakers. You can fit cans as small as a pint to as large as a rectangular gallon sized can. One difference between the Tornado II and F5 paint shakers is the intensity at which they shake the paint. Both paint shakers come with a 15 minute timer built in. The Tornado II shaker will take most of the 15 minutes to throughly mix your paint, whereas the F5 will mix the same paint in about 5 to 7 minutes. The F5 paint achieves this thought a more intense mixing motion, the only downside to this more intense motion is the F5 shakers losses a little stability. The only other difference between the Tornado II and F5 paint shakers is the length of warranty. Tornado II comes with a 1 year warranty and the F5 comes with a 2 year warranty. Both warranties do not cover the replacement of the springs as these are wear items and have the possibility of breaking and bending due to the use of the paint shaker. However with the F5 you will receive a complementary set of springs the first time you have a damaged one. The compact size of these paint shakers make them an ideal addition to your tool kit. These paint shakers will allow you to mix up your paint at your own convenience instead of having to make multiple trips to home improvement stores to have your paint mixed up again. This saves you time and will allow you to finish your project quicker. These paint shakers can be very versatile in their use. These machines can be adapted to be used in laboratory situations as well as even a bar. 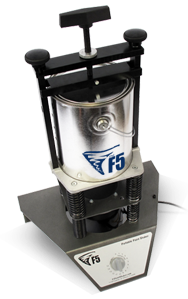 We have had customers use a F5 paint shaker to mix up gallon sized batches of margaritas. To make sure your application fits on the either of these paint shakers here are the dimensions of the paint shaker. The top of the top bar with the clamp removed is 9 and half inches tall. The width of the shaking platform is 6 and 5/8 inches wide. The base of each paint shaker is 6 and 7/8 long front to back. With the clamp at the tallest position the height is 8 and 1/2 inches tall and at the clamps lowest position the height is 5 and 3/8 inches tall. With the clamp in the horizontal position the widest position is 6 and at its narrowest is 3 inches wide. UShake.com has the largest inventory of paint shakers and replacement parts for those shakers. We have technical from Monday through Saturday available from 9 am to 5 pm, eastern time. We will also be available on our live chat during those hours as well. We can also be reached by email 7 days a week and we will respond within an hour of receiving your message. If you have any questions or would like to share your creative use of these paint shakers, please give us a call." Ushake.com is your resource for commercial quality paint shakers. We are dedicated to bringing you the most in demand paint shaker brands such as the F5 and Blair Tornado II. These portable electric paint shaking units were selected for their high quality and durability. Although there are other paint shakers in the market, we've specialized in portable units as they are truly effective, easy to use and affordably priced to help your growing business. Our #1 goal is to meet the needs of our customer; therefore we've stocked large quantities for quick shipping and bulk purchases. Plus with guaranteed low prices and informative U.S. based sales & technical support team - we've got your back from the moment you browse our product line to the time you make your purchase to the day you use your unit and beyond. In fact, we also supply replacement parts for both F5 and Blair Tornado II product lines. Finally, we don't just sell paint shakers – we also use them everyday. Learn more about us and our story! * The F5 paint mixer shakes containers via its three axis operation: horizontally, vertically and in a circular fashion. Its simultaneous movement quickly creates an even mixture. * Portable, light weight unit that easily travels with virtually no set up time. Powered by a 120V AC motor and plugs it into a standard 110 outlet. * With an included adjustable clamp, the F5 paint mixer is so versatile it adapts to the sizes and shapes to accommodate your mixing needs. * Offers an easy to use front panel timer for a shorter or longer agitation cycles (up to15 minutes). * The F5 paint mixer includes a two year limited warranty from the date of purchase covering defects in manufacturing and or craftsmanship. * The TORNADO II mixes paints completely utilizing three axis of motion, including orbital, side-to-side, and up/down. * To achieve these multiple motions, the portable shaker spins an eccentric weight rather than using crankshafts, belts, or pulleys which can wear out and break. 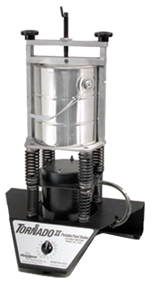 * The fewer moving parts also minimizes noise while the paint shaker is in operation. * A quick and easy to use four point clamping mechanism securely holds containers during the agitation cycle. * Blending cycles can be set to numerous time intervals via the convenient up-front control panel. * Blair Tornado II Paint Shakers have a full one year warranty from date of purchase against defects due to faulty material or workmanship. FREE SHIPPING - you only pay packing and handling of $7.95,1 Free Per order.Not applicable towards parts. © Copyright 2002-2019 Web Direct Brands Inc.
Ushake.com, the leading source for Tornado 2 Paint Shakers, and F5 Paint Shakers!